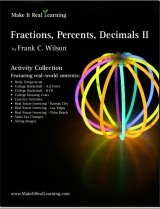 The Make It Real Learning Fractions, Decimals, Percents II workbook focuses on real-world situations that may be effectively analyzed using decimals, ratios, histograms, and percents. This book suits best middle and high school, meaning that some activities here suit best middle school students, and some suit best high school students. From determining how to analyze a real estate deal to determining college housing costs, learners get to use mathematics in meaningful ways. Each activity integrates real world information, companies, and issues (e.g. BYU, Air Force, college basketball, real estate investing, sizing images, sales tax), not just "realistic" data.